This unique wine cup of white nephrite jade was made for the Mughal emperor Shah Jahan (r. 1628-1658) and is inscribed with his title, Second Lord of the Conjunction. This follows the conventions of royal titulature in the Persian-speaking world, and specifically alludes to Timur, the Central Asian ruler from whom the Mughals were descended. It is dated 1067 of the Islamic calendar, and regnal year 31, which means that it was made in 1657 AD. In the 19th century, the cup was owned by Colonel Charles Seton Guthrie (1808-1875), a renowned collector of Mughal and other hardstones. 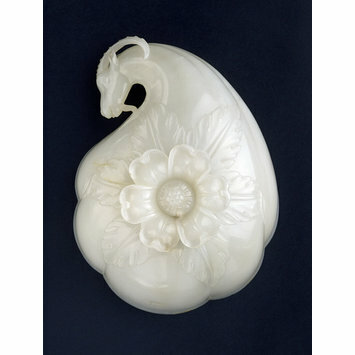 White nephrite jade wine cup with lobed body, resting on a flower foot worked in high relief. The naturalistic goat's head recurves towards the body. On the outer wall is a small cartouche giving the titles of Shah Jahan as Lord of the Second Conjunction, the date 1067 and the regnal year 31. 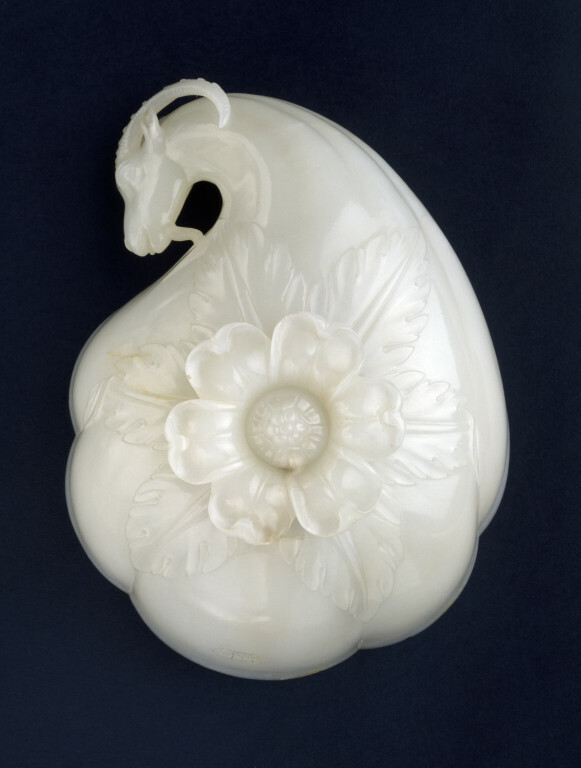 White nephrite jade wine cup, made in the court workshops at Agra or Delhi, dated 1067, regnal year 31, ie 1657. Swallow, Deborah and John Guy eds. Arts of India: 1550-1900. Text by Rosemary Crill, John Guy, Veronica Murphy, Susan Stronge and Deborah Swallow. London : V&A Publications, 1990, pp. 94-95, ill. no. 73. Rogers, Emma: Arts of Asia, vol. 45, no. 5, September - October 2015, "The Parasol Foundation Trust Programme: digitising and cataloguing the V&A's South Asian collection. ", p. 111, pl. 39. Susan Stronge, 'Colonel Guthrie's Collection', Oriental Art, vol. XXXIX, no. 4, 1993-4, fig. 1 p. 5. Rosemary Crill, in The Indian Heritage. Court Life and Arts under Mughal Rule, V&A, 1982, cat. 318, p.111, ISBN 0906969263.